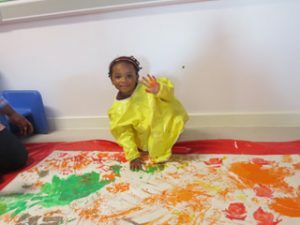 Keir Hardie Children’s Centre is the place to come if you live in Canning Town or Plaistow and have a child under the age of 5. 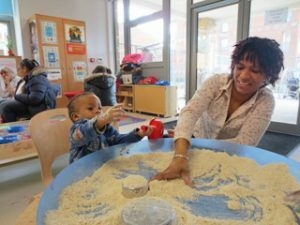 We offer a range of exciting play activities that parent/carers and children can enjoy together – from messy play with sand, water, cornflour, paints etc to storytelling and a singalong. If you want to keep fit or lose weight there is our popular “Women’s Aerobics” class or perhaps you want to enrol on a course or get back into work. We are here to help! Maybe you have concerns about your child’s eating habits or language development, about breastfeeding or weaning. 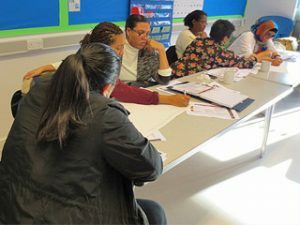 Come to one of our regular health sessions delivered by trained professionals. 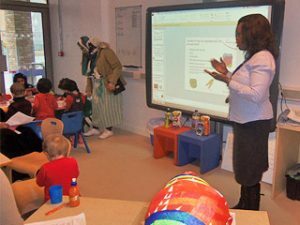 Looking for a childminder, a nursery or a school? We can show you what is available locally. Our friendly and knowledgeable staff will be happy to assist in any way they can. 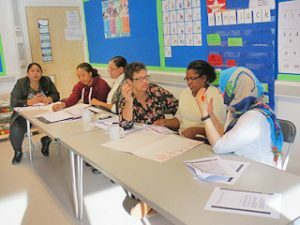 Our Family Support Worker is here to offer support and advice and our Childminder Co-Ordinator would love to meet you if you care for someone else’s child. All our activities are free, so please drop in to see us. You will always be welcome. 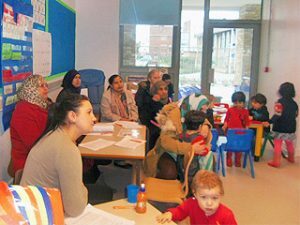 On 12th December 2018, Some of our parents and children accompanied us on a visit to Stratford Circus to see a stage adaptation of the popular Julia Donaldson book, The Gruffalo. A great time was had by all! 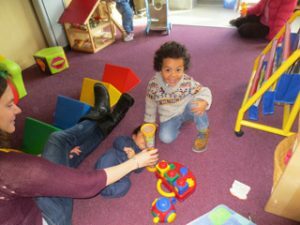 Our Baby and Toddler Group runs from 9:30am – 11:15am on a Tuesday morning. 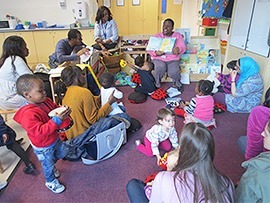 There are plenty of activities, toys and books for you and child to explore, and we finish off the session with a singalong to all your children’s favourite nursery rhymes! Our Baby Club runs on a Monday from 1pm to 2:45pm for parents and babies aged 0-12 months. 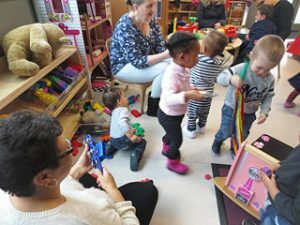 It is a safe and vibrant space for babies to explore their environment and play with toys and activities aimed at stimulating their developing senses and motor skills. 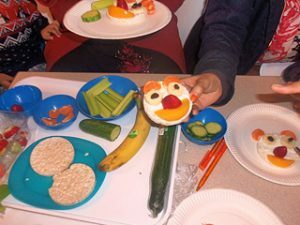 We all know how important it is to have our 5-a-day but we also know how difficult it can sometimes be to persuade small children to eat fruit and vegetables. 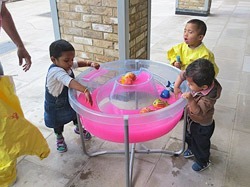 Our trained Outreach Worker has lots of tips and ideas to help tempt your child. 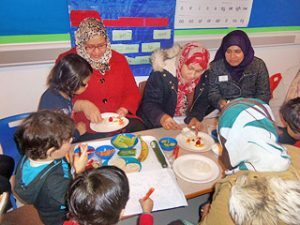 Feedback from parents who have attended a promotion session has been very positive, with children now being more adventurous and more willing to try new, healthy options. 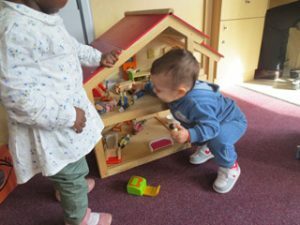 Our busy Stay & Play session runs on Tuesday mornings from 10 – 11.15am and is open to all parent/carers with a child between the ages of 0 – 4 years. 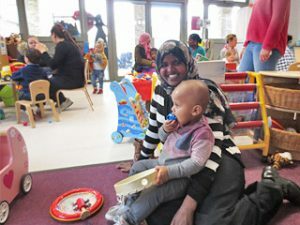 The session provides an opportunity for parent/carers to play with their child, get to know others with similar age children and benefit from the advice and support of our trained Outreach and Family Support staff. 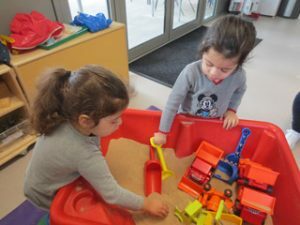 This session offers children, and adults, the opportunity to “get messy” and experience the fun of playing with sand, water, paint, play foam and a host of other messy materials that you may not have space to provide at home. 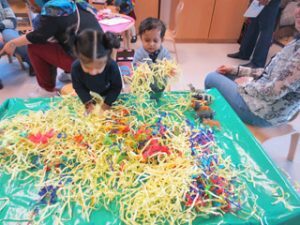 Messy Play runs from 10 – 11.30am on Fridays. 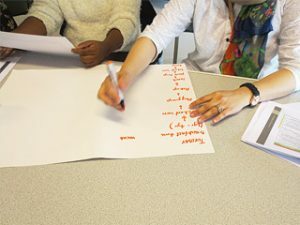 If you are a registered childminder, or a carer for someone else’s child, why not speak to Andrea, our Childminder Co-Ordinator, and book onto our very informal, monthly training sessions which cover a variety of topics from “What do OFSTED look for in a childminder” to “The Importance of Play”. 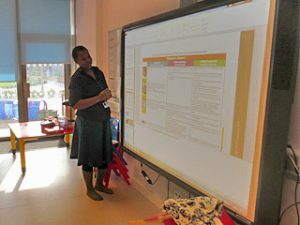 You will also get to know the other childminders who live in this area and will benefit from sharing good practice. 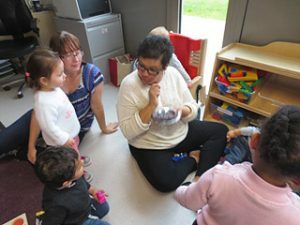 Crèches are provided to support these sessions. Children have lots of energy and our Saturday morning Gym Tots session, which runs from 10-11am every Saturday during term time for families with children aged 18 months – 5 years, offers the opportunity for children to channel this energy and develop balance, co-ordination and safe risk-taking skills as well as many others. This session is particularly suitable for dads/male carers and working parents but all are welcome to attend.